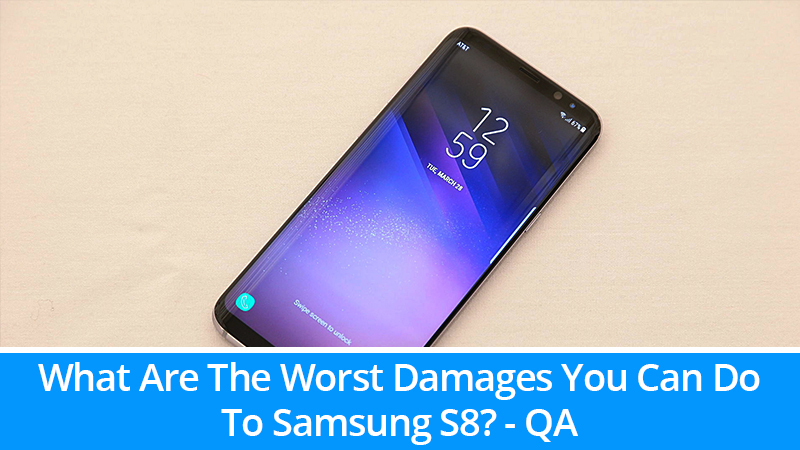 HomeSamsungSamsung S8SmartphonesWhat Are The Worst Damages You Can Do To Samsung S8? What Are The Worst Damages You Can Do To Samsung S8? Anyone who is in search of cutting-edge technology without cutting down into their savings, Samsung S8 is an exceptional choice. This phone is till-date a champion amongst Android phones; it has multiple features and comes at a wallet-pleasing price. If you have broken your phone and want to choose a budget-friendly device, then Samsung S8 is the best option for you. Mobile phones have become a status symbol; everyone takes utmost care of their phone to cast a good image upon others. It doesn’t matter how much time you spend on clearing out old applications, finding out multiple ways to ensure that software is being updated, mobile phones have a lifespan and after a certain period of time, you will inevitably need to replace the old phone. One can hardly think of any reason why someone would deliberately damage their phone – all damages to essential gadgets like mobile phones are accidental. There are plenty of ways you can cause accidental damage to your phone. It may drop in the toilet or your mobile screen may be shattered when you are having a jog. Samsung S8 is one of the smartest choices and is preferred by many people. Over time, it has built repute for being extra fragile; it is updated with Gorilla Glass. If you are concerned about fragility, Galaxy S8 Active is somewhat more durable. It is an amazing-looking mobile phone which combines a lot of top-notch features in one device. The product is made up of glass and it is marketed as infinity screen; it is easily recognizable because of its large and beautiful curved display. You can easily hold it with one hand, though you will need to reach back for the fingerprint unlocking. If you are planning to change your phone in near future, then Samsung S8 is a nice bet. Who likes to look at a screen that is full of scratches? It is highly recommended to get a practical phone-case to protect your fragile Samsung S8. A protected and secure phone-case will prevent major damage in event of a drop. However, the most expensive phone case cannot prevent your phone from dropping; these inevitable drops can damage your phone significantly. Even if you don’t see a shattered screen or a dented corner, then there may be a possibility of inside damage caused by a lethal fall. Water damage, faulty power button, and screen crash are the worst damages that you can do to your S8 (spoiler alert: there are many other damages that can be equally heart-wrenching). Some common causes of accidental water damage to your device include falling in the toilet, dropping into the sink, dipping in the pool or a glass of water spilling over your phone. Accidents happen and most of the times, they can be recovered. You can get your phone repaired and bring life to your device. In most cases, data in your phone can be recovered. There are multiple things you must do before bringing your device to a professional repairing company. If your Samsung S8 has undergone water damage, immediately remove the sim card. Secondly, remove the memory card and anything important that might be plugged in the device. If it got wet, simply dry gently with a towel. There are some other things that you must avoid if your device S8 has experienced water. Never push any of the buttons; if you press any button forcefully water will get into your device and it will damage the internal circuits. Don’t use any hairdryer or blower on the phone as it will push all the water inside and will cause further damage. If your phone fell in the water, never turn on the phone immediately afterward; it is good to wait for 24 hours before turning your phone on. Just bring your water-damaged Samsung S8 to any service centre to enjoy fast and friendly services. Numerous technicians are available throughout the UK that will open your phone, dry out internal components on a priority basis, and rinse the device of any wreckage and test to make sure everything is alright. Testing is an important step; they will test all the parts of your cell phone and replace them if damaged. Samsung S8 is water-resistant and it works reliably for occasional water splashes; that being said, it’s still highly recommended that you never intentionally dunk the device in water. If you do so, it may create unnecessary pressure and completely damage your device; in this case, you will be unable to recycle Samsung S8 at all. It could be a nightmare if you are having trouble with your Samsung S8 power button. It becomes problematic to turn on your phone; this may be the most irritating and worst damage because it temporarily stops you from doing all things on your phone unless you have set up a voice or fingerprint method to activate a sleeping screen. With a broken power button, you will be unable to use your device properly. The buttons of your S8 could get depreciated with daily use if you use your mobile phone recklessly. Additionally, if you drop your smart device in a bad way, internal components of the power button can get loose and resultantly cause a connection failure. It is rather tricky to determine if the power button is really damaged or the phone is unresponsive temporarily. Firstly, it is best to ensure that your phone battery is not dead. You must get your phone charged overnight and then try the power button gently and repeatedly. If the power button still doesn’t work properly then there could be a damaged power button issue. Get this issue fixed by a certified service centre. A proficient technician will power on Samsung S8 by removing the battery and plugging it into the charger. After a few minutes, the phone will get started by itself. However, it is still important to get it repaired, otherwise, it will cause further damage to your mobile phone. Professional diagnosis and repair will minimize the risk of damage. In hardware issues like this, it is best to consult a specialist as they have better knowledge and experience to fix your device issue. Based on its reputation for fragility, it is also recommended to establish an alternate method to unlock the phone, like biometric or voice recognition. If the screen of your Samsung S8 gets cracked or damaged, then you must bring your phone to an approved service centre. If you avoid repairing and use the phone with a cracked or shattered screen, it can be harmful for you; the longer you delay repair work, the more it is going to cost you. Screen replacement is relatively a simple task and if you didn’t get your screen repaired then you may end up with other hardware damage which seems worst. Accidental damage may even make you eligible for a free screen repair. Samsung is also offering warranty options for cracked screens for S8. Samsung S8 is a premium mobile phone having an all-glass body, so it is prone to damages. If you ever face any annoying quirks, you must take your phone to a service centre for repair. Users opting for Samsung Premium care in the UK are enjoying Samsung Mobile care offers and reaping benefits in case of accidental damage. Always keep a backup of your cell phone data, in case the damage is irreversible, you will not be lamenting the loss of your precious data. If you are told by a professional that the damage is too severe, you will always have the option to recycle Samsung S8 and buy a new mobile phone.